For more than 30 years, the production of training material with different technical approaches, has been an important component of the PAHO / WHO Disaster Program. These include publications, video productions and online courses about risk reduction, preparation and disaster response. This section contains the complete collection of this material. Abstract: A simple tool that can be used, by the Hospital Administrator or CEO, to determine if the facility is safe to continue operations and its level the functionality following an event. 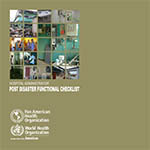 Provides guidance when assessing the impact on the structure, lifelines, hospital equipment, medical supplies and staff. Abstract: This Toolkit (still under construction) is comprised of previously developed instruments such as the Hospital Safety Index. The Green Checklist and other accompanying tools support the Safe Hospitals Initiative and will guide health officials and hospital administrators in achieving SMART health care facilities. 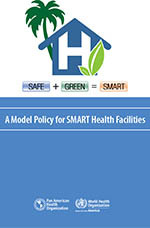 Abstract: This publication aims to guide the health sector in developing a policy on SMART health facilities, a policy that forms an integral part of the health agenda of PAHO’s Member States; is backed up by earmarked resources in the national budget; and counts on commited leadership at the highest level of government. 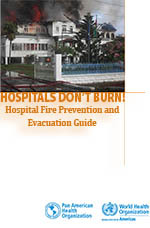 Abstract: This guide was created to address the vulnerability of hospitals to fires. All possible steps should be taken to minimize the hazard of fires in hospitals and the need for evacuation. The guidelines can be applied to existing hospitals that can be retrofitted to improve safety against fires, as well as to proposed facilities. 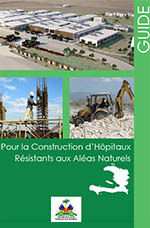 Abstract: This guide and accompanying materials--in French--have been designed specifically to aid in the construction of hospitals, safe from earthquakes and hurricanes, in Haiti, but the patterns shown may be of use to many countries and communities.